Eliminate the headaches and challenges of archiving and protecting your valuable data with a Cybernetics Virtual Tape Library. Incredibly easy to install, manage, and scale, the iSAN V7000 VTL is a powerful disk based backup solution with up to 240TB of raw, native capacity. Naturally immune to malware, cryptolockers, and ransomware, the iSAN V7000 delivers unparalleled data security that can be further increased with optional encryption. Writing backup data disk-to-disk is much faster than writing direct to tape. Restores from virtual tape archives can be initiated instantaneously and also operate at disk speed. Our VTLs are capable of ingesting and storing backup at over 4 TB/hour. You can execute multiple backup jobs concurrently to independent logical libraries to reduce overall backup time. The VTL copies backup data to tape as a background task without requiring use of your backup software. Directly attached tape devices involve no network traffic. Offload to tape is also efficient, operating at the rated speed of the tape drive. Advanced byte-level, hardware-based deduplication reduces the disk space needed to hold backup images. The space reduction is typically over 98% of the original size, giving you the ability to store more backups in less disk space. Thin-provisioning of virtual tapes also helps to minimize disk space usage. At typical data deduplication rates, a single VTL chassis can retain for immediate restore the equivalent of over 1,000 TB of backup storage in normal expanded form. 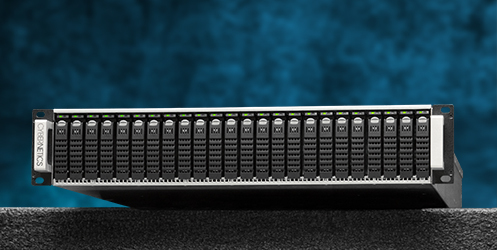 Our VTLs offer more host and device interfaces than other systems- including iSCSI, SAS, and SCSI, 10 Gb Ethernet and Fiber Channel on the iSAN® V Series. We also have SCSI-to-iSCSI or SAS-to-iSCSI converters available so virtually any device can be connected. Our VTLs support replicating data to a remote location. replication of deduplicated data is feasible over even a modest bandwidth connection. The system automatically manages copies of data at the primary and replication site. Use your existing tape backup processes, software, and equipment. We work with any standard tape drive or tape library for emulation and output of backup images. You can specify the output destination down to individual slots. Our VTLs can work with any existing architecture, even mixed operating environments concurrently.